Lock in a great price for Best Western Poitiers Centre Le Grand Hôtel – rated 8 by recent guests! Great central location; Hotel de Ville car park adjacent and only €2:40 overnight. Many excellent eateries around the hotel. The location was perfect. We will stay longer next time. Hotel very nice and clean. Bed really comfy. Staff was very friendly and helpful, particularly the front desk staff and Marie the restaurant hostess at the buffet breakfast who was exceptionally accommodating and pleasant making two Americans feel very welcome. Breakfast was excellent with local specialties and a very good value. 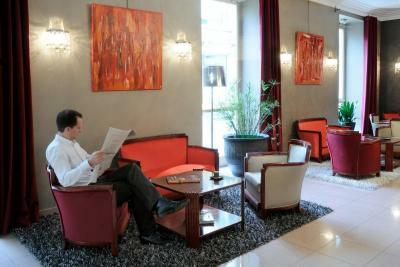 The hotel was well located in town and just a few minutes away from the main square and the Hotel de Ville. It was located to the rear of the Main Street. My room was large, quiet, well equipt, modern and clean and comfortable and with a big bathroom. Great breakfast and eggs cooked to order. Pleasant and professional staff. Good value for money. Will return and recommended. The best thing in the hotel is the breakfast, the lady there took care of us and she was over nice. 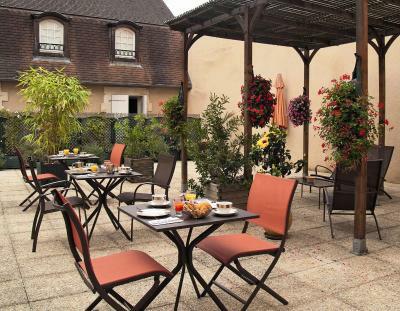 One of our top picks in Poitiers.Le Grand Hotel is a designer hotel located in central Poitiers, within walking distance of Noter-Dame la Grande and Poitiers Palace. It offers air-conditioned guest rooms with a contemporary décor. Each soundproofed room is equipped with a private bathroom, satellite channels on a flat-screen TV and free Wi-Fi. The hotel rooms are serviced by a elevator. 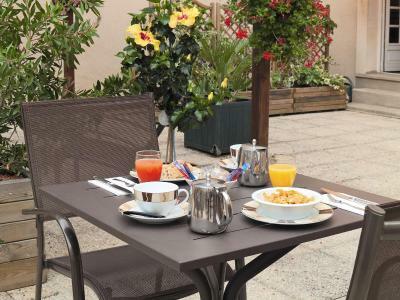 Best Western Poitiers Center Le Grand Hôtel serves a buffet breakfast, which can be enjoyed in the comfort of your room, in the dining area or on the shaded terrace overlooking the garden. There are numerous restaurants and Poitier’s historic sites nearby the Grand Hotel. It’s less than a 15-minute walk to Gare de Poitiers. When would you like to stay at Best Western Poitiers Centre Le Grand Hôtel? Private parking is available on site (reservation is needed) and costs EUR 7 per day. 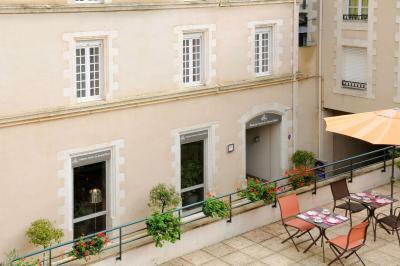 Ideally located in the heart of the historical and touristic city center of Poitiers. The 4 stars the BEST WESTERN Poitiers Centre Le Grand Hotel is situated in a quiet interior court, along the street of many restaurants. A refined setting in a building with character, the hotel offers 41 comfortable, spacious and bright rooms, six individually decorated suites, air-conditioning, free Wi-Fi, satellite television, mini-bar, and hairdryer. A regional breakfast buffet is offered in your room, in the dining room or out on the sunny terrace during the summer. We serve locally produced jams, yogurts, cheesecake and butter cookies. 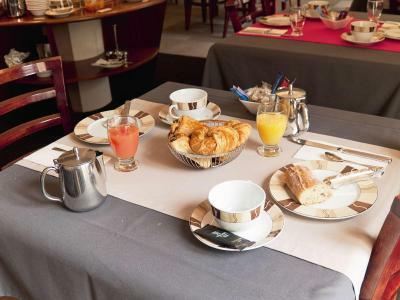 The BEST WESTERN Poitiers Centre Le Grand Hotel is listed in the following guides Le Guide Michelin, le Gault & Millau, le Bottin Gourmand, le Guide du Routard, le Petit Futé, Qualite Vienne. We are also located only five minutes away from the Theater and Auditorium of Poitiers (TAP), which offers various artistic programs throughout the year. Enjoy your stay. House Rules Best Western Poitiers Centre Le Grand Hôtel takes special requests – add in the next step! All older children or adults are charged EUR 7.50 per person per night for extra beds. Best Western Poitiers Centre Le Grand Hôtel accepts these cards and reserves the right to temporarily hold an amount prior to arrival. The hotel is in the centre of Poitiers. It is extremely clean and this time we had a good sized room. The shower head was broken and really Great Western get your act together with decent towels. Mine were so thin . The staff are amazing especially Marree and her co worker in the breakfast room.The staff on reception were helpful. Comfortable room, large comfy bed. Very welcoming friendly staff. Comfortable clean hotel right in the centre of town with secure (if extremely tight) parking. A very nice breakfast. The towels could be larger! The location was superb, right in the centre of the town. Plenty of bars, restaurants and shops nearby. Bed was not the most comfortable, it was a bit too hot in the room (even though it was winter and cold outside). There was no dark curtain in front of the large tall window to block out the light in the morning. Shower, bathroom, and the toilet were not amazingly clean, there were few bits of dirt here and there. Hotel is in great location in city center, near many of the restaurants and shops. It was quiet in the room. Breakfast staff very helpful although would have liked more choice. Perfect position for shops and lovely park. The hotel is right in the centre of Poitiers, about a one minute stroll from the main square. It has an underground car park, although there aren’t many spaces for the hotel guests. There are many bars and restaurants in the immediate area. Location, style and staff. On-site parking OK but cost extra.